There seems to be something fundamentally wrong with the way most growth marketing agencies close and serve their clients. We knew it and decided to do something about it. Is what we did going to prevent you from hiring one of these agencies? Most likely not. However, at least, it will help you understand that when it comes to growth marketing agencies, you (always) need to do your research. 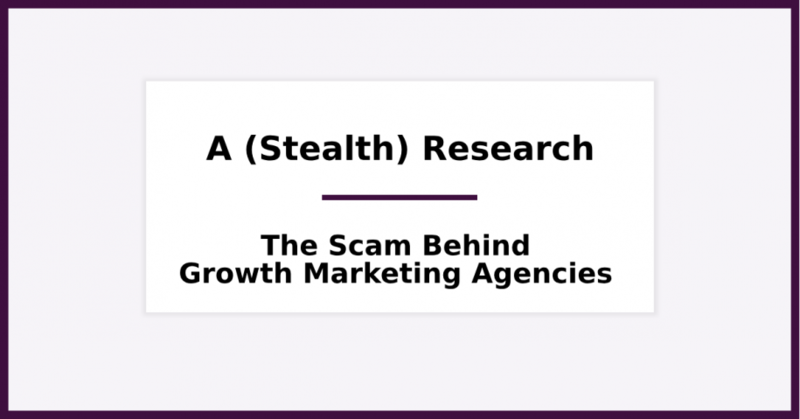 The “why” behind this research is simple: we wanted to uncover the way growth marketing agencies sell their services and close new clients. You see, we live in a climate of misinformation, quick wins, and “growth hacks” that promise growth equal to Dropbox, Airbnb, and Robinhood. However, most of the times, these promises don’t come easy. To be clear: we knew most of these agencies since we work in the same industry. The point was not to make a list of direct and indirect competitors, but to follow the journey anyone searching for a growth marketing agency could follow. 2) Then, we made a list of the most popular results in the SERPs (Search Engine Results Page). The process that we used is relatively simple, even for someone who is not savvy. In fact, anyone can follow the same journey as we did, and see for herself. What is more interesting though, is not how we conducted the research, but what we discovered. Note: We used only organic search results for our research, and not results from Google ads. 4) Finally, we contacted each one of the agencies in our list and tried to get on a “Discovery Call” with them. Only 4 (four) of the agencies that we contacted didn’t respond, while 2 of them initially responded but never got on a call with us. Maybe because of a scheduling conflict or due to other reasons, we never managed to get them on a call. Thus, we jumped on calls with 9 (nine) of the agencies in our list, to discuss the needs of a real company, with real business needs. 1) Where is the Discovery Phase? Is it possible that an agency that makes thousands (and even millions) of $ in annual revenue, to not have a Discovery Phase? You can put a “yes” in that column. 63.6% of the agencies that we managed to get on a call either didn’t have a clear Discovery Phase, or included it in the first meeting. If you are wondering why the Discovery Phase is essential, let me give you a quick example. Let’s assume that you visit the doctor for a health issue that you have. What’s the first thing that the doctor does when she sees you? She asks questions. And, why is this important? Because she can’t prescribe you anything before discovering what’s wrong with you. *We can share contact details for the two agencies upon request. That’s a bold statement, but most of the proposals we received were rushed (and looked scammy). 66.6% of the proposals we received were sent within 5 (five) days, with just one meeting and no discovery questions. 53% of the proposals were promising “growth hacks” that were irrelevant to our pretending needs. Most proposals were selling all of the agency’s services, without caring about our pretending business needs. 26.6% of the proposals we received were promising outdated practices that could get us penalized in the post-GDPR era—for example, cold Emailing is (still) ok and works fine. A small percentage (13%) used false statements—for example, x tactic optimizes Conversion Rate by 8% (as if this benchmark, and can work for everyone). Finally, many proposals were focusing on quick conversion (a staggering 40%), rather than throughout break-down of our problems and the proposed solutions. Moving down the rabbit hole, we found out that most growth marketing agencies use buzzwords and complex jargon to impress their prospects. To what extent? Just keep reading. That’s common among growth marketing and growth hacking agencies. However, throughout our undercover research, the BS-and-fluff-meter turned red. We saw how vividly agencies use buzzwords and complex jargon, as a way to impress the prospect. Do prospects fall for that? Most likely, yes. For us, it was just another red flag, as we were trying to uncover the inefficiency behind the fancy words. We knew that agencies like to talk about themselves, their case studies, the companies they’ve worked with or the rewards they’ve received, But, we didn’t expect that to overshadow the Discovery Process. Especially, to the degree that the most frequent words we got to hear were “We are,” “We did,” “We achieved,” and “We had.” That’s another red flag. And, it applied in 60% of the cases. Don’t (ever) fall for that. 5) Junior Marketers; Why Not? Taking a look at the profile of employees working in large growth marketing agencies, we identified a pattern. Most of the agencies—with a few exceptions—mostly employ junior people. In fact, 53% of all the agencies we included in the research, employ 51.5% of junior employees on average. This is not a red flag on its own; but combined with the fact that these junior employees are called to handle and solve complex marketing problems, without supervision and a clear process, it can be a big flag. Our initial assumptions came true: most growth marketing agencies care mostly about closing the sale (even though their sales process is far from outdated) and then pass the client to a junior who must deliver on a project that far exceeds their skills or knowledge. Why? Because a junior is far cheaper than a more experienced employee. The best part? That many of these juniors (usually called as “growth hackers” or “growth experts) are coming from totally irrelevant—and even non-digital—fields that have nothing to do with marketing. Educate yourself, and compare the proposals you hold in your hands. A doctor’s job is to fix you, not to please you. Stop buying services that please you, and start hiring responsible people that are data-driven and support their statements with facts. Ask difficult (but fair) questions. Ask them about a few times they failed and why; check their portfolio, approach past clients and ask about them. Hire the people that explain the why’s and the how’s and stop trusting “growth hackers” and other (self-taught) magicians. If you want to hire a growth hacker, at least learn what growth hacking is first. Watch this course to learn more. Growth hacking can be implemented after finding a product-market fit (PMF). Did you know that? Don’t worry; most growth marketers don’t know either. Watch this masterclass to learn everything about PMF. So, there you go: you visit a growth marketing agency’s websites. You are pumped by the client logos, the (irrelevant) testimonials they have at the bottom of their page, by their well-crafted website copy, and by their “x Ways to Improve your Facebook Ads Performance” blog post. My question is: would you work with that agency? The internet is a place where (literally) anything can be transformed into something valuable and attractive. Only, most of the times, we don’t know what’s behind the curtains. My point is: if a shed can be transformed into London’s best restaurant, why can’t a group of junior marketers with a non-existent discovery process can sell services of thousands of $ to startup founders, and business owners? But, we like to see the positive side of things. If anyone can (still) sell growth hacks and cheap marketing tricks with short-term effect, then anything in marketing is possible. Note: Throughout this process, we identified two agencies that indicated a high level of professionalism. They even resisted on giving us a price quote, if they didn’t have more information on our company or additional data. We respect that, and we acknowledge their honesty. If you want us to give you their names, feel free to write to us, and we’ll share further details.